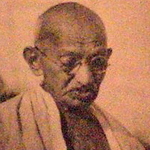 Remembering Gandhiji on this day, 30 January 2013. 'Father of our Nation', Mohandas Karamchand Gandhi, 'Our Gandhiji' was assassinated 65 years ago on 30th January 1948, by Naturam Godsey, leaving the Nation in darkness! I pray for Gandhiji's soul and hope that his spirit will bring back the light we have lost! Gandhiji and Nehru had a dream -- a prosperous and united India -- the proud nation is still trying to reach that goal! In spite of modernism, we still believe in religion, integrity and family values, and One hopes that the 'Vibrant dream' will be fulfilled soon. To achieve this dream, One must remember here that the nation needs its people to work very hard forgetting all their differences.